** Originally published in the July August September 1994 Abu Farwa Issue of the Crabbet Influence magazine. 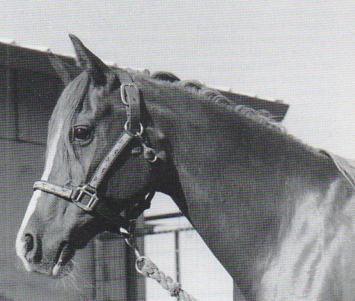 “HOME OF BEAUTIFUL HEADS AND GREAT PERFORMANCE HORSES” had been the catch phrase used by Carleton Cummings to advertise his Skyline Trust Arabians during the 1950s and early 60s. The phrase well describes the special contribution of Cummings’ premier sire, Antezeyn Skowronek, to Arabian horse breeding. This contribution has proven to be long lasting and is his trademark as a sire within the ranks of CMK breeding programs. 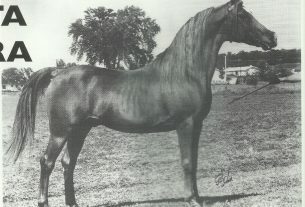 Antezeyn Skowronek was the third ranking son of Abu Farwa for the number of foals sired (just over 100) and the number of Class A halter champions sired. However, he heads up the list of Abu Farwa sons whose sons have sired Class A halter champions. Quite a number of progeny of Antezeyn Skowronek matured to become the truly deluxe showhorses of the 50s and 60s in the Pacific Northwest. These were real beauties, tauted for their versatility, whose heyday has perhaps come and gone since the advent of the specialized horses which come to a show to be exhibited in one event or class category. 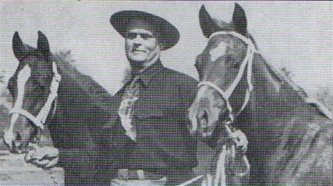 Horses like Khatum Tamarette (Canadian and U.S. Top Ten Mare and the first mare to be awarded the Legion of Merit), Rissantez Skowronek (a brilliant showhorse who had been gelded, but not before siring the three-time Pacific Northwest Champion Stallion Walla-Nar), Rossanek (who had also been gelded but not before siring champion Krishan and three daughters who had each produced champions), Aglaia, and Berkantez Skowronek, to name several of Antezeyn Skowronek’s progeny which seemed to appear at every Northwest Arab show in class after class, in some instances year after year, and amass what must have been ‘truckloads’ of ribbons and trophies. 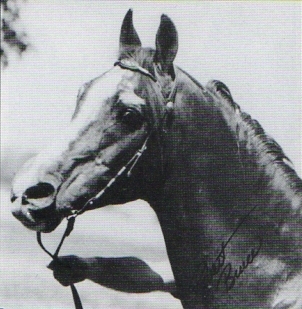 Cummings stated once that for a three year period, the get of Antezeyn Skowronek had won more ribbons than any other sire of any other breed, a claim that even Gladys Brown Edwards chose not to dispute given the successful records of so many of his get. Antezeyn Skowronek was striking in his nobility of carriage and spirit. These traits transcended the sometimes harsh circumstances of life which had taken their physical and emotional toll. That regal bearing, his gentle quiet nature, and the enormous sparkling eyes is my memory of Antezeyn Skowronek when I first saw him. He had been the unfortunate pawn in a suit against the estate of Carleton Cummings brought by Cummings’ former manager. 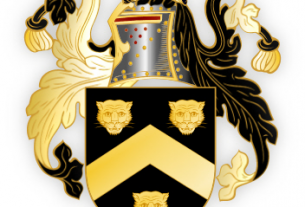 When the suit was settled, Cummings’ daughter, Jean Marlatt, had asked that my father and I come get the 16 year old stallion in what turned out to be his rescue and something of an adventurous journey. This journey was beset by slides (having nearly ended up under a major one in particular), washed-out back roads, and the threat of blizzard, for a 17 hour round-trip between Spokane, WA and Salem, OR. It was my 16th birthday. I shall not forget the first time I jumped on the back of this great stallion to gallop across the open fields near my house. I remember the exhilaration of feeling so much horse in front of me, such was his lofty, upright bearing. Then and there I decided that this was the kind of horse I would forever wish to ride. It had been my privilege to have Antezeyn Skowronek on lease during the years 1965 to 1969. These were happy, productive years for him, and he was well received by other breeders in Oregon. One of my proudest moments was the day Lester and Jennie Walton unloaded their Canadian National Champion Mare, Ga’Zima, and her dam Zimada, to be bred to Antezeyn Skowronek. Ga’Zima proved to be a shy breeder and we were not able to get her in foal that year, but Zimada did get in foal in that and the following year. In 1969 my parents decided to return Antezeyn Skowronek, now age 20. Cummings’ daughter could not keep him herself and decided that he should be offered for sale. 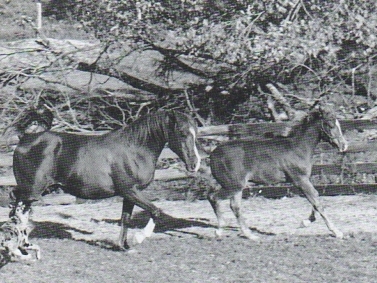 He was purchased by Lois Selby Perry, daughter of Roger Selby, who had accompanied her father some years before to see the Cummings’ horses. She recalled the favorable impression Antezeyn Skowronek had made on her and her father. I flew with Antezeyn Skowronek on the cargo jet from Portland to Chicago on the first leg of his trip back to Connecticut. It was to be the last time I would ever see him. 1970-77 were the East Coast years for Antezeyn Skowronek. He did not settle in well at Lois’s farm, so it was decided that he should go to Marguerite Illing of Parksville, N.Y., where he would not have the competition of other stallions, which had been particularly worrisome to the old patriach. Antezeyn Skowronek was well promoted and had the opportunity to sire some fine horses. One of the fillies from this period had been shown successfully and was named New England Futurity Champion. By the time Antezeyn Skowronek was in his mid-20s he developed serious health problems. At 25 he was sent to the Cornell Vet Hospital to be put down. A fortunate turn of events allowed Michael Bowling to come to his rescue this time, and on New Years Day, of what was to be Antezeyn Skowronek’s 26th year, he went to Michael’s Maryland farm where he would remain for nearly three more years. These last years proved peaceful and productive for the grand old horse. He sired several foals and spent his last months in a quiet, shaded, grassy pasture with his companion mare, Niranzi. Antezeyn Skowronek was finally put down, due to his infirmaries of old age on Thanksgiving of 1977. During his Maryland years he sired Enchanted Gold, his youngest daughter and now a broodmare for Michael and Ann Bowling’s New Albion Stud in California. He also sired Rowdi Sorcerer, the last son of Antezeyn Skowronek at stud today, who is owned by Virginia Graybill of Thurmont, MD. 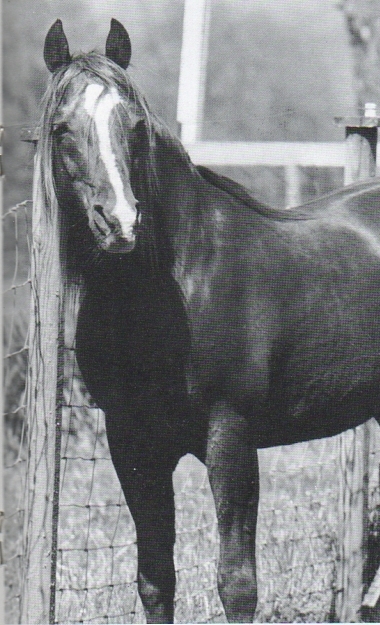 Rowdi Sorcerer was himself a Maryland Futurity Champion and has sired both halter and competitive trail champions. Rowdi Sorcerer (Antezeyn Skowronek x Grand Sloopy) at age 14. Antezeyn Skowronek was a unique son of Abu Farwa, not resembling that horse to a great degree, nor any other of the Abu Farwa sons. Antezeyn Skowronek did strongly show the influence of Gulastra and *Nasik, bearing a marked resemblance to the latter. Antezeyn Skowronek also showed the influence of his maternal grandsire Antez. The gold metallic sheen of his coat, sensitive, almost human expression, and kind disposition, most certainly came down from Antez. Antezeyn Skowronek’s second dam, Ferdith, was by Ferseyn out of Ardith, who brought in more Davenport breeding plus a cross to *Abu Zeyd, whose influence some breeders also identify with Antezeyn Skowronek. Jericho Cortez by Rifala’s Naseem, owned and shown by Rick Synowski. The Skyline-bred Raseyn Gezan (Canadian Top Ten Stallion) and Rifala’s Naseem were Antezeyn Skowronek’s most productive sons. Both stallions stood their entire lives in British Columbia. Raseyn Gezan sired the most foals and the most champions and was for years the leading sire of champions in Canada. Rifala’s Naseem was on the other hand my personal favorite. One year at the B.C. All-Arabian Show, Rifala’s Naseem had been named champion stallion, his son Jericho Cortez won the reserve championship, and another son Jericho Antez was awarded the Legion of Merit after having been named Canadian National Breeders Champion Stallion. Jericho Cortez and Jericho Antez, full brothers by Rifala’s Naseem and out of Skyline Carlette by Raseyn Gezan, were both then linebred grandsons of Antezeyn Skowronek. Other crosses which doubled up on Antezeyn Skowronek were met with signalled success. Concorde Gezan by Raseyn Gezan out of a Rifala’s Naseem daughter was yet another example of the beauty of the cross. He became a Top Ten Performance Champion in both the U.S. and Canada. Horses were bred with three crosses to Antezeyn Skowronek which again proved meritorious. By in large these were individuals with the predictably lovely forehands, quality, free movement, athletic ability, intelligence and disposition. A shining example of the triple Antezeyn Skowronek horses is Anterion RS by Skowronek’s Antez, owned by Larry and Barbara Liljeqvist of Houston, TX. Anterion, like the versatile Antezeyn Skowronek showhorses of 30-40 years ago, has amassed hundreds of ribbons in halter, English pleasure, hunter pleasure, driving, and antique buggy competition. 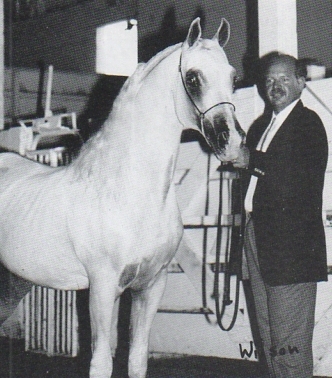 In May of 1993 the first filly with four crosses to Antezeyn Skowronek was born, Silver Felicite by Jericho Cortez. Now a yearling, she is ‘the filly of dreams,’ displaying the beautiful forehand and brilliant movement which have become trademarks of Antezeyn Skowronek influence. Her almost human personality is equally reminiscent of Antezeyn Skowronek. Thurman Farm’s mare Antezara (Antezeyn Skowronek x Jadi Tshar) with her foal TF Red Empress, by the Antezeyn Skowronek son, Rowdi Sorcerer. Present-day CMK breeders who have concentrated on the breeding and influence of Antezeyn Skowronek include Kim Johnson of Belesemo Arabians of Caldwell, ID and Barbara Byrd of Thurman Farm, Berryville, VA. Kim herself has owned several daughters and granddaughters of Antezeyn Skowronek. Barbara owns the Antezeyn Skowronek daughter, Antezara, who has proven a most valuable broodmare for her. She is the dam of TF Red Rambow, winner of many 100 mile endurance rides and eligible for the world championship ride in Belgium this summer. Antezara has produced TF Granny Smith, winner of competitive trail, junior hunter and three day event trials with Barbara’s daughter, Immy Byrd. In a recent conversation with Michael Bowling I learned that it had been his association with Antezeyn Skowronek that had inspired him to work toward the preservation of Crabbet/Maynesboro/Kellogg (CMK) horses and the breeding they represent. This was most ironic since it had been my association for 28 years with the Antezeyn Skowronek son, Skowronek’s Antez, which had brought me to follow the same path. Perhaps this will in the end become the most far-reaching contribution made by this truly great Arabian stallion.